It fills the rocky hill outside the window. Where there has been such little growth so far, a smoldering blaze of flowers all contained in frightening thorny branches. The sun warms the flowers so that their sweetest coconut scent fills the fields. For the first time in weeks there is promise and hope of spring. It restores and revives. And I bask in it! Yes Bridget and it comes with sun today, Yay! Not here it isn't, sadly. How I long for the golden gorse, and its smell! It is on it's way!!! 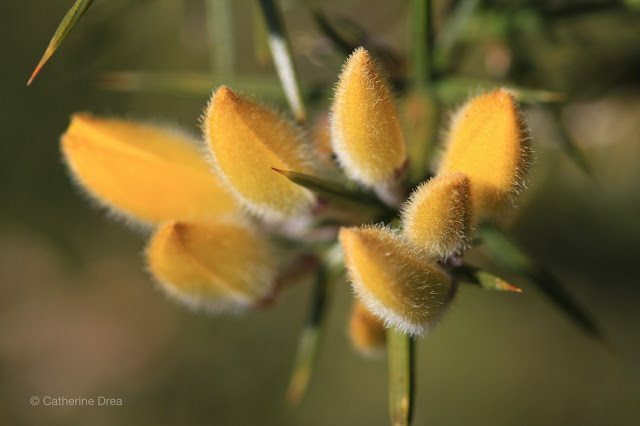 Oh I adore gorse. To me it smells like coconut! I'll have to think of almonds the next time I smell some. Alex I think coconut might describe it even better….anyway…..at least a kind of nutty and sweet!! Beautiful warming images. The weather forecaster has just promised me that Spring is arriving here at the end of next week … yay! 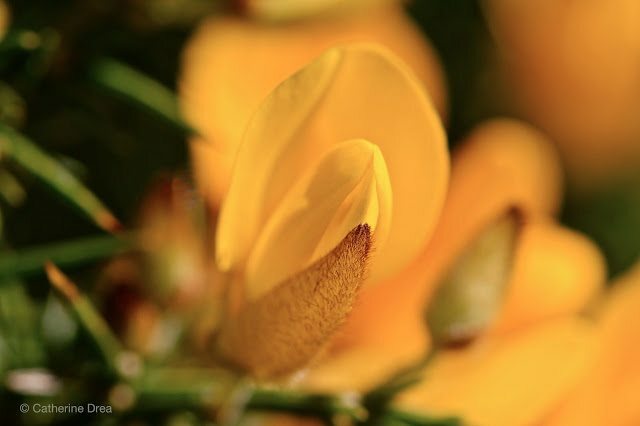 I'm in the (smell of) coconut camp…and love the gorse for its tenacity at flowering whatever the weather – especially in these cold winds. Your golden blaze is breathtaking… Spring! She's tiptoeing into my gardens, too! 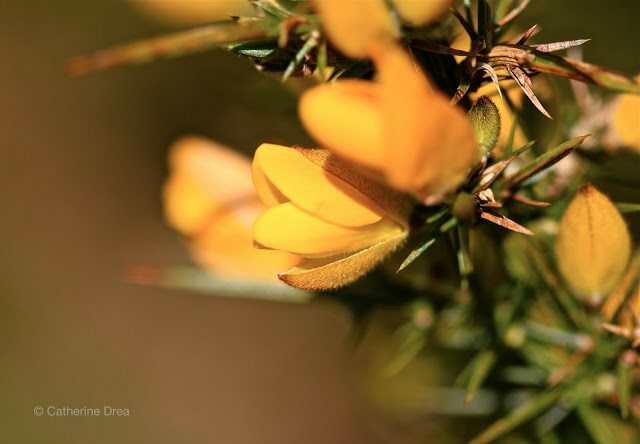 Gorse is definitely spring in Ireland and here on Vancouver Island as well! Does yours smell like coconut oil? It does here but I can't remember the smell when I was on your island in spring…lovely shots. FYI – I am posting but blogger is not letting my followers know! These are beautiful captures and so full of spring promises! OMG…I can't imagine coconut aroma! I would be in major bliss. Coconut is my favorite! Enjoy every minute of it. With a tentative outlook, may we say or hope that Spring is not too far off and will join us before "Summer" arrives!! Y-E-S-S!! And what stunning color! These radiate warmth and hope. I too love the coconut scent. Your blog is beautiful. Deep and striking all at the same time. I have been wandering through your most recent posts and relishing the words you thread together to accompany your pictures. Thank you for sharing all this with us. Have you ever come across Amélie's blog: http://diaryforelsa.blogspot.fr/ I cannot help but think that you might like it too. Lovely to see some golden colours in your post just what I need to warm me up! Although we have more sun this cold I wish it wasn't so bitterly cold the plants in the garden look so forlorn. How beautiful, Catherine! 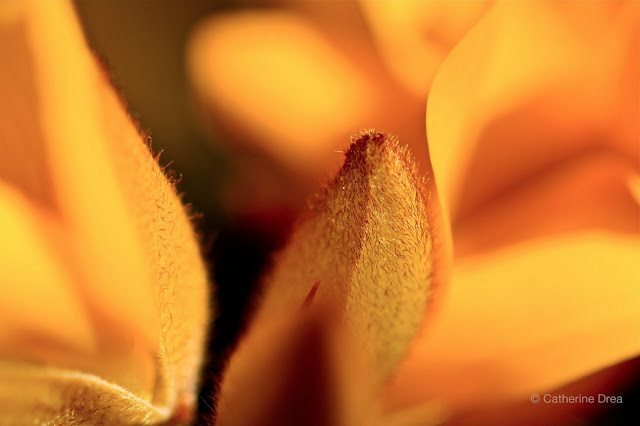 The smooth petals, the golden glow, the growth – and to share with us the scent? Perfection! Love, love love spring! Catherine what fabulous golden blooms to bring warmth and sunshine! Thank you for your warm comment on my blog, which thus gave me the joy to discover Foxglove Lane. Warmth radiates from your stunning photography. Something for my part of the world to look forward to. Hope is a good thing.